As President Obama escalates the newest war in the Persian Gulf, the question is whether remembering September 11, 2001 eases the pain and makes sense out of all that has happened since. Martha and I had just settled into our offices in The Interchurch Center that day, more than 100 blocks north of the World Trade Center. On September 11, 2001, Martha directed public relations and communication for the United Church of Christ Pension Boards on the 10th floor (as she still does), and I was communications officer of the U.S. conference for the World Council of Churches on the 9th floor. Instinctively, I turned to my keyboard and typed http://www.ap.org. The Associated Press had moved a tentative story with a file picture of the twin towers. “What a mess,” I thought. I could imagine a small plane veering off course from Teeterboro and straying into one of the 1,340 foot-high towers. No doubt some office workers in the tower had been injured. Martha called back. “We have an office on the 19th floor,” she said. “We can see the towers from there.” I met her at the elevator and we went up. Tom, the office IT director, shook his head as we walked in and nodded toward a southerly window. 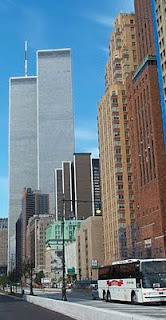 The towers were nearly seven miles south of us, but in my memory they seemed just a few blocks away. Black smoke billowed from the northern façade of the North Tower, and I still assumed an errant small plane had done the damage. Most of the people in the office had stopped looking out the window and had returned to their tasks. We watched the smoke streaming eastward for several minutes. “I have a service downstairs in the chapel,” Martha said. One of her coworkers had died over the weekend, and Martha, an ordained Baptist minister, was in charge of the memorial. We thanked Tom for allowing us to satisfy our curiosity and walked out. Seconds after we closed the door behind us, the second plane hit the South Tower. An hour later, when Martha and her colleagues emerged from the memorial service, both towers were fully involved in flames and on the verge of collapse. Across the river in Hoboken, Martha’s cousin Tony watched in horror as people leaped from the towers to escape the flames and fell to their deaths on the plaza below. Martha’s cousin Alina was stranded with her colleagues at Brown Brothers Harriman on nearby Wall Street. In the Empire State Building on 34th street, Alina’s husband, Steve, was making urgent calls to her office to see if she was all right. Back at the Interchurch Center on 120th Street, my colleagues Jean and Sonia were literally holding each other up as news came of the collapse of the North Tower. Jean’s niece, who had been staying with her that summer, worked at one of the buildings adjacent to the towers and Jean had been unable to reach her. As I sat in my office overlooking the Hudson River, I spun my radio dial, seeking additional updates. I listened briefly to an FM deejay who said he was broadcasting from one of the towers. “They’re telling us to evacuate,” he said excitedly, “But I’m staying at my post as a public service, ‘cause folks need to know what’s goin’ on …” I spun past him looking for 1010 WINS or another all news station and didn’t give the deejay a second thought. But 13 years later, I wonder: did the guy wise up and get the hell out of the tower? Or did I accidentally tune in to his last words on earth? It wasn’t easy getting news about what was happening outside. I began receiving emails from a World Council of Churches colleague in Geneva, Switzwerland. Martin Robra, a German Lutheran peace activist, was monitoring the news in Europe and it was in one of his emails that I learned a plane had also struck the Pentagon in Washington. “You are at war,” Martin wrote ominously. Our offices in The Interchurch Center at 120th Street and Riverside were far from Ground Zero and still unaffected by the calamity that was unfolding downtown. Two days later, a foul yellow haze that stung the eyes and burned the throat would spread throughout all of Manhattan. But in the midday hours of September 11, the air was still clear uptown. If you turned northward toward the George Washington Bridge, it was a beautifully pristine late summer day. Outside the city, persons following the events on television wondered if all New York was in flames. Our son, Will, then a junior at Port Chester High School, left an urgent message on Martha’s cell phone. He had heard the city was under attack by military jets flying out of the White Plains airport and he pleaded with his mother to get in touch with him. Unfortunately, we didn’t get the message until hours later, when we were all safely home. Daughter Victoria was in sixth grade in Port Chester on September 11 and we felt sure she would be safe with her teachers until the end of the day. However, daughter Katie was in a special education program in an outside school district and needed to take a school bus home. What the traffic situation would be like in Westchester County was anyone’s guess. “Let’s go pick up Katie,” Martha said. I told Jean and Sonia that we were heading home, and they waved their hands as if to shoo us out. “Be careful,” Jean said. She had just heard that all bridges and access routes to Manhattan has been closed. As it turned out, Riverside Drive was virtually empty. When we got to the Bronx-bound Henry Hudson Bridge, I looked for signs it had been closed. Instead, an MTA officer waved us through the tolls. We made it to Katie’s school in Ardsley in half the usual time. But there were scores of cars jamming the high school parking lot. Parents from all over the district had come to take their children home. We parked at the far end of the lot and headed for the nurse’s office to sign Katie out. We found ourselves waiting in a line of anxious parents as a stressed-out gray-haired nurse scolded us. “This is crazy,” she hissed, “You people are over-reacting,” as she impatiently scribbled her signature on dismissal slips. After several minutes, Katie was escorted to the office by her teacher, Erin. Erin smiled at us but she must have had other things on her mind. She knew her brother, an employee at Cantor Fitzgerald, could have been one of nearly 3,000 people killed at the World Trade Center. It would be weeks before his remains were identified, but hours after the attack his fate was still unknown. That night, as the sun began to set on September 11, the Port Chester members of the family were safely home on Wesley Avenue. Throughout the tri-state area that night, thousands of shaken people who made it home kept an eye on their neighbors’ homes to see if they returned safely. But many never did. It’s difficult to exaggerate the worldwide effects of September 11. The attacks – and our reaction to the attacks – had an indelible impact on billions of people. On September 12 we learned that our British friends John and Bridget had been traveling from London to New York on September 11. When U.S. airports closed, their flight was diverted to Nova Scotia. They and other passengers were taken in by friendly Canadian farmers until the planes started flying again, on September 14. Our daughter Lauren had planned to fly from Washington State to Philadelphia on September 11. It was not easy to find loving, life affirming acts in the aftermath of September 11. It’s not any easier today as the war in Afghanistan, launched as a direct reaction to the terror attacks, goes on and on. For many of us, the murder of Osama Bin Laden a decade after the attacks did little to ease the anger and salve the grief. Perhaps one of the most prophetic statements that came out of September 11 appeared within days after the attacks. It was called, “Deny them their victory,” and it was written by four interfaith leaders* and signed by 4,000 people, including Martha and me and perhaps including you. The statement continued: “The terrorists have offered us a stark view of the world they would create, where the remedy to every human grievance and injustice is a resort to the random and cowardly violence of revenge – even against the most innocent . . . The terrorists must feel victorious. Ten years after the attacks, I still can’t bring myself to watch the television images of the planes crashing into the World Trade Center. They are simply too painful. But there was another historic event that occurred less than a week after September 11, 2001, and many religious leaders have called upon people of faith to recognize it whenever they pray about September 11. On September 17, President George W. Bush, in an extraordinary act of statesmanship, began his day with a visit to a mosque in Washington. He bought coffee for a cafeteria full of people as he appealed to Americans to get back to everyday business and not turn against their Muslim neighbors. “Those who feel like they can intimidate our fellow citizens to take out their anger don’t represent the best of America, they represent the worst of humankind and they should be ashamed of that kind of behavior,” Bush said. The judgment of history is still pending on George W. Bush, and millions of his admirers and critics engage in spirited debate about his preparedness for a terrorist attack, or his decisions to go to war in Afghanistan – a war that continues to this day. It was a reminder that should engage us all as we look back on those terrible days. And looking back, we will always wonder if the U.S. response of war and mass destruction was the correct one. Or would the world be different today if we have responded with a courageous “vision of community, tolerance, compassion, justice, and the sacredness of human life”? * The writers of “Deny Them Their Victory” were Jim Wallis, Wesley Granberg-Michaelson, David Saperstein, and Bob Edgar.